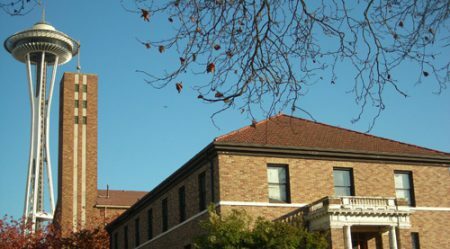 The Sacred Heart Shelter is located on lower Queen Anne and is a temporary shelter that offers a safe, home-like refuge to homeless families in Seattle. Sacred Heart functions under the premise that every person is entitled to a safe place to sleep. We believe that the transition from homeless to housed is one that takes time, effort and perseverance. Sacred Heart Shelter operates as a support network for people as they go through that process. The staff works with residents to develop goals, obtain health and dental care, job and parent training, childcare and ongoing support and assistance towards the ultimate goal of locating stable, permanent housing. One call connects you to housing resources in King County. The Mary’s Place Family Emergency Shelter Access Line provides a single access point for families looking for shelter and housing resources. For more information, please click here to visit the Mary’s Place website. Sacred Heart Shelter empowers residents in their efforts to stabilize their lives, connect to resources in the community, and achieve secure housing. To see every homeless family make the transition to stable housing, equipped with the skills and resources to sustain it. 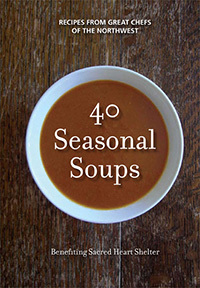 40 Seasonal Soups is a cookbook of wonderful, seasonal soup recipes. The Seattle area’s best chefs and restaurants, from local gems to those that are nationally renowned, contributed all of these delicious recipes. This user- friendly cookbook celebrates soup as the ultimate comfort food. Extremely versatile, soup can start, finish or headline any meal–and can range from luxuriously decadent to fundamentally basic, easily modified to fit any budget. Your tax-deductible financial donations enable us to provide a safe, warm place for homeless families to stay. To make an immediate and secure online donation, click here. Sacred Heart Shelter also welcomes bequests and memorial gifts, as well as other types of support. Please contact Gillian Parke, Program Director, at (206) 285-7489 to discuss a wide variety of ways to give. Looking for other ways to support Sacred Heart Shelter? Consider making an in-kind donation! Whether it’s everyday items like baby and hygiene supplies or household items and appliances that you no longer have use for, we’re always looking for donations to help keep the Shelter well-stocked and supplied. If you have items you’d like to donate, or are wondering what items we’re in need of, please contact Jameson Jones, our Volunteer & Resource Coordinator. We also encourage you to check out our Amazon Wish List for items that we need! Thank you for your help! For other questions regarding direct contributions, please contact Jameson Jones. Children’s Program: Be a role model for the children of Sacred Heart Shelter! Help create a safe, fun place for children to just “be kids” as they build healthy relationships and explore ideas and feelings about themselves and others through play and activities. The Children’s Program happens Sunday through Thursday, 6:30-8:00 p.m. Click here for more information. Office Support: We like to think of these volunteers as ambassadors of the shelter. The office volunteer answers the shelter door and phone and helps residents with daily requests and performs various duties as needed. Volunteers are needed from 9:00 am to 6:00pm each weekday. The typical shift is 2 or 3 hours. Click here for more information. Dinner Cooks: Prepare evening meal for up to 30 residents of the shelter. Groups or individuals are welcome to cook a meal consisting of an entree, vegetable, bread/starch, and 2 gallons of milk or juice. We prefer that volunteers cook the meal on-site and provide the ingredients. Dinner is typically served at 6:00 p.m. Click here for more information. Miscellaneous: Occasionally volunteers with specific skills do projects like tutor residents on job search techniques, help with our special events, or plant a vegetable garden. Do you have a particular skill or interest? Feel free to reach out to Jameson Jones, our Volunteer Coordinator!